I mean seriously, its one thing that most everyone (sorry-not-sorry vegans / veggies) can enjoy. But how do you make bacon better than you get in the store? Well you make it yourself of course! I was first exposed to this idea when my neighbor, Matt, smoked a pork belly about a year ago. It was incredible, Thanks Matt! 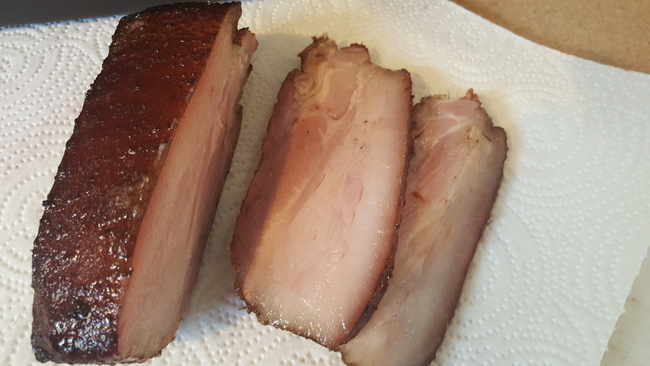 About a month ago I decided to take my first crack at the fatty smoky goodness. 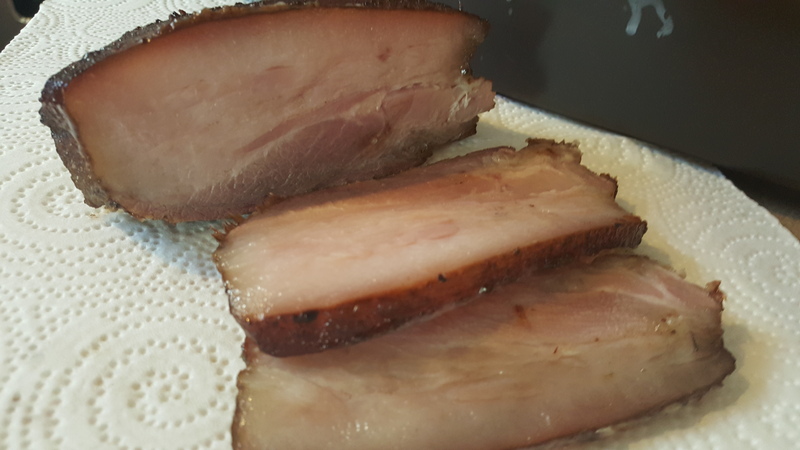 I found a whole Pork Belly at Earth Fare up the road from the neighborhood. I’ve always been a big fan of their meats. I went ahead and purchased the whole belly, it was pretty entertaining watching the cashier trying to ring it up. Later that weekend I smoked that bad boy and we had bacon for a couple of weeks. Naturally I wanted to up my game a bit more the 2nd time around. 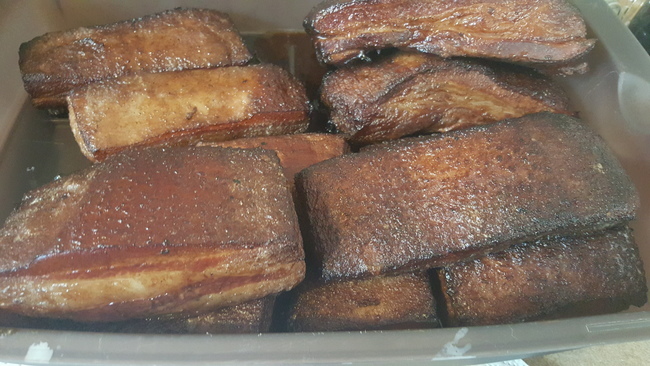 So last Thursday I bought a whole belly like last time. Only instead of just smoking it straight away, I decided to take a crack at salt curing the pork first. I cut the belly (of about 11#s) into 1 / 2 # slabs. Seasoned heavily, coated in salt, and put into an air tight container in the fridge. Ever couple of days I had to pull it out and drain off the liquid that was being extracted by the salt. It should be ready to go in about 5 days, mine stayed in for about 9 days before I had time to smoke it. To smoke I borrowed Matt’s charcoal smoker (thanks again Matt), instead of using my electric. The charcoal is gives it a great flavor, plus you can use the larger wood chunks instead of the small chips. After firing up the chimney and filling the water pan full things were ready to rock.Before you place the belly on the grates, you’ll need to rinse it off with cool water to remove the salt. You want to get the internal temp to around 160 degrees F. I try to keep the smoker around 240-250 for this process. This time around I used Maple instead of Hickory (next time it’ll be cherry). Man was it salty! Outer slices of the bacon were just way too much. It was better the farther into a slab you got. The flavor was amazing, but the salt just overwhelmed it. Next time, if I salt cure at all, I think I'll only go for a few days.